The Trump administration announced Tuesday afternoon that Russia and Syria are gearing up to launch a mass strike in Syria on behalf of embattled President Bashar al-Assad, risking the lives of "millions of innocent civilians," according to an announcement. 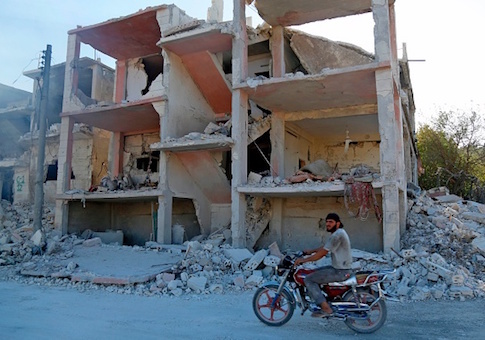 "The United States is closely monitoring the situation in Idlib province, Syria, where millions of innocent civilians are under threat of an imminent Assad regime attack, backed by Russia and Iran," the White House said in a statement. "President Donald J. Trump has warned that such an attack would be a reckless escalation of an already tragic conflict and would risk the lives of hundreds of thousands of people," the statement reads. "Let us be clear, it remains our firm stance that if President Bashar al-Assad chooses to again use chemical weapons, the United States and its Allies will respond swiftly and appropriately." "The United States will continue to work tirelessly with its Allies to find a lasting diplomatic solution to resolve the hostilities in Syria under the auspices of United Nations Security Council Resolution 2254," the White House said. This entry was posted in National Security and tagged Syria. Bookmark the permalink.